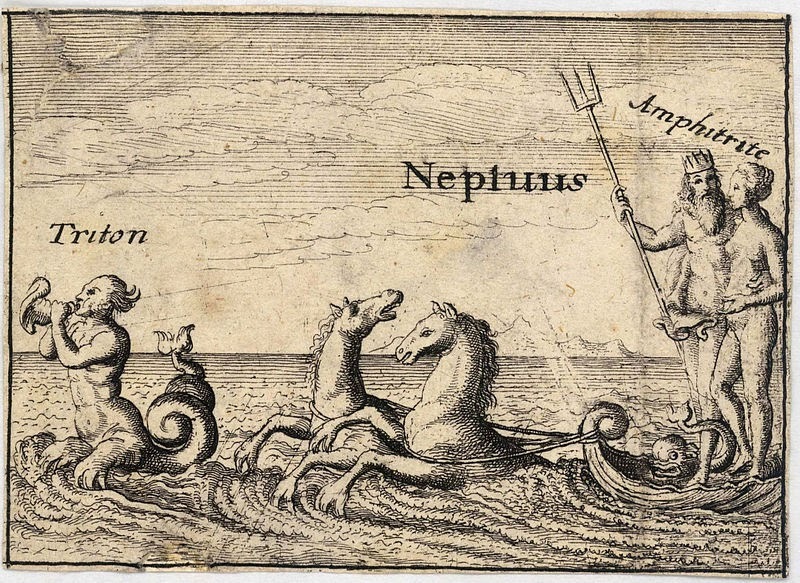 During these Neptunian times, is it Poseidon/Neptune showing his full wrath or Zeus/Jupiter giving some anger back in the direction of the watery god? other favorite item, the twisted conch shell. Poseidon is one of the twelve Olympian deities of the pantheon in Greek mythology. His main domain is the ocean, and he is called the "God of the Sea." Additionally, he is referred to as "Earth-Shaker" due to his role in causing earthquakes, and has been called the "tamer of horses." He is usually depicted as an older male with curly hair and beard. The earliest attested occurrence of the name, written in Linear B, is Po-se-da-o or Po-se-da-wo-ne, which correspond to Poseidaōn and Poseidawonos in Mycenean Greek; in Homeric Greek it appears as Ποσειδάων (Poseidaōn); in Aeolic as Ποτειδάων (Poteidaōn); and in Doric as Ποτειδάν (Poteidan), Ποτειδάων (Poteidaōn), and Ποτειδᾶς (Poteidas). A common epithet of Poseidon is Γαιήοχος Gaiēochos, "Earth-shaker," an epithet which is also identified in Linear B tablets. Another attested word E-ne-si-da-o-ne, recalls his later epithets Ennosidas and Ennosigaios indicating the chthonic nature of Poseidon. Another theory interprets the second element as related to the word *δᾶϝον dâwon, "water"; this would make *Posei-dawōn into the master of waters. There is also the possibility that the word has Pre-Greek origin. 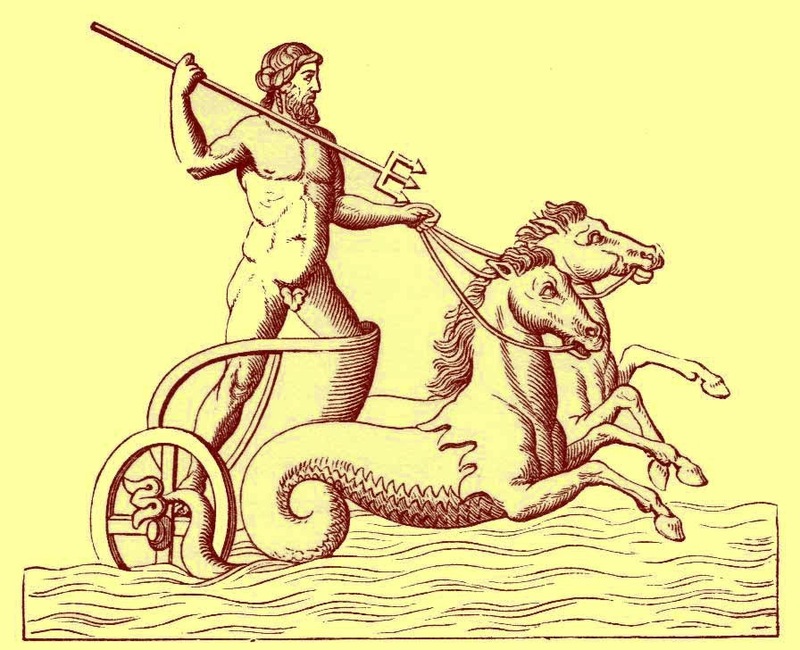 Plato in his dialogue Cratylus gives two alternative etymologies: either the sea restrained Poseidon when walking as a foot-bond (ποσί-δεσμον), or he knew many things (πολλά εἰδότος or πολλά εἰδῶν). Source. A July 27, 2014 mid-afternoon lightning strike hit the water off Venice Beach, California, and killed a 20-year-old man. It instantly injured 15 or more others — one of them critically. The second victim, who is in critical condition, was a 55-year-old male who had been surfing. The beachfront in Venice was hit by at least four direct lightning strikes about 2:20 p.m., said Stuart Seto of the National Weather Service. Firefighters said a bolt of lightning hit the water and the electrical current then traveled, hitting swimmers and surfers in and out of the water near the 3500 block of Ocean Front Walk. The man who died was swimming in the water and disappeared under the waves after the lightning strike. He was pulled from the water 90 minutes later, given CPR and transported to Marina Del Rey Hospital in critical condition, according to ABC7. The 15-minute thunderstorm struck as more than 20,000 people were visiting the southern portion of Venice Beach, sending beach-goers scrambling for cover and nearly six dozen rescue workers into action. 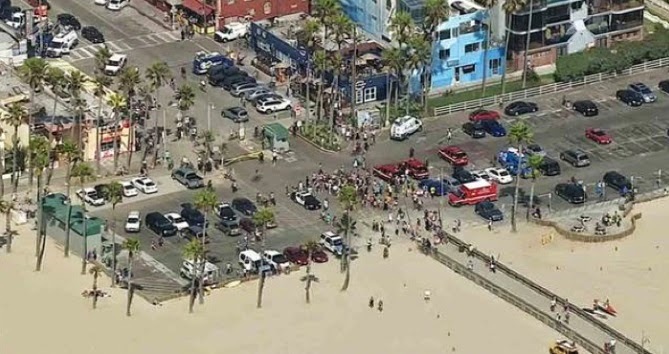 The Los Angeles City Fire Department sent 47 firefighters, eight ambulances and five fire engines to the 3800 block of Ocean Front Walk in Venice after receiving the first call for aid at 2:21 p.m., said fire spokeswoman Katherine Main. 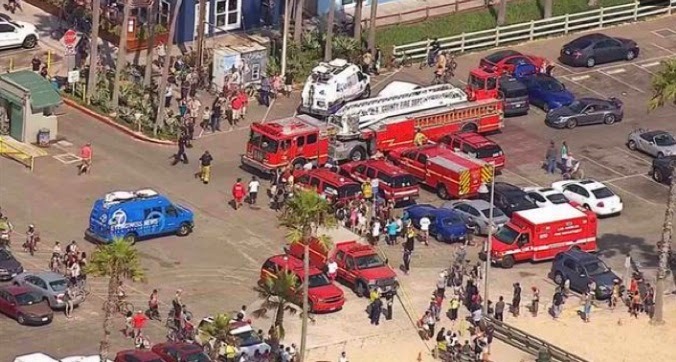 Firefighters set up a triage area on the south end of the parking lot from Venice Pier, reported the Los Angeles Times. The deceased young man has not been identified yet. "It was all blue skies, except there were some dark clouds coming from the south," Gabe Anderson, 28, said. "Then just one big crack of lightning — pretty unexpected." 1958: Touch of Evil (Orson Welles)—Shot entirely in Venice except for one indoor scene, selected by Welles as a stand-in for a fictional run-down Mexican border town. The real-life scene in Venice Beach looked like a set from a movie. For more on another Venice Beach incident, see Two Venices, Two Deaths. Lightning from the same storm hit Catalina Island about 90 minutes earlier, injuring a 57-year-old man on a golf course in Avalon and igniting two brush fires. A car caught on fire after lightning struck a home in Redondo Beach, also on Sunday, knocking wires down. The incident occurred in the 1600 block of Haynes Lane. Three to four homes were damaged. No one was injured.